The Newtown Historic Association curates a collection of heritage materials from the greater Newtown community. The collections and archives are housed at the historic Half Moon Inn (Court Inn) in Newtown, PA. 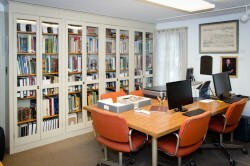 The NHA also maintains a facility for the research and study of the local history. The Newtown Historic Association invites you back in time to experience the life of Newtown’s most famous artist, Edward Hicks. 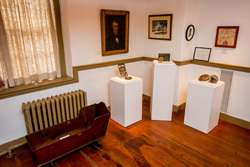 The Edward Hicks Room displays many of the treasurers owned by Hicks during his lifetime. These items include a double-faced swinging sign portraying William Penn’s Treaty with the Indians and Penn’s Landing at Chester in 1844. This collection of over 150 photographs of Newtown and Bucks County is from circa 1900. The photos were taken by William Randall and donated by Norman and Ida Kitchin. The photos are mostly from glass plate negatives. 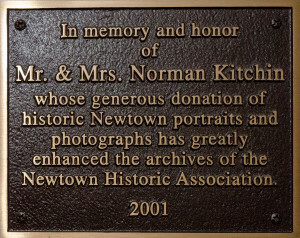 For more information on the collection, please visit the Research Center or contact the Newtown Historic Association. The Philadelphia Area Consortium of Special Collections Libraries (PACSCL) site provides access to finding aids for manuscript and archival collections held by its members, a group of 36 libraries and archives, whose collections offer primary resources on national, regional, and local history; the natural and social sciences; world history; literature; religion; art and architecture; business and industry; and the performing arts. 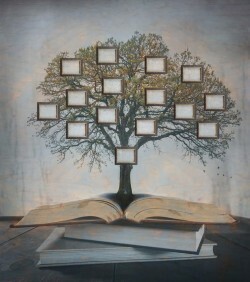 It also hosts finding aids for smaller institutions in the region prepared through the Historical Society of Pennsylvania’s Hidden Collections Initiative for Pennsylvania Small Archival Repositories.